PolyTrans is the leading industry standard for comprehensive visualization and data translation of all 3D CAD/CAM, VisSim and Digital Content Creation data. With its support of virtually every 2D and 3D file format you will need no other tool to visualize 3D models and translate them to your format of choice. With a user base of the entire 3D industry, and being in use constantly by 3D professionals like yourself, PolyTrans works 'out of the box' in the most complex and demanding of situations - it simply works!. Over the last 2 decades PolyTrans has set the standards for scene conversion, animation transfer, skinned mesh & skeletons conversions, trimmed NURBS surface + curve conversion, automatic bitmap conversion and many more innovative solutions. Okino is also well known for its personal, hands-on and fast technical support plus customer relations. PolyTrans (and its elder brother NuGraf) are stand-alone programs which were written with one purpose in mind: to produce the most accurate, error free and robust conversions between all 3D DCC, VisSim and CAD file formats. PolyTrans was the first such program to market and hence has a long standing reputation of providing quality conversions as well as top notch technical support from its development team. The elder NuGraf program also provides for print quality photo-realistic rendering and more user interface controls for interactive scene composition. Converts entire scene files, including meshes with holes, trimmed NURBS, hierarchy, animation (format specific), pivot points, vertex normals, U/V tangent vectors, vertex colors, texture coordinates, textures, lights & cameras. Converts & optimizes all major CAD formats to MAX, Maya, XSI, LW, FLT and dozens more file formats and 3D programs (full list on WEB site). Cross-converts between all major animation packages and 3D file formats with true robustness & quality. Import and compose 3D scenes from a plethora of 2D/3D file formats then render out to high quality images for print media, WEB presentations, training manuals, or marketing brochures. 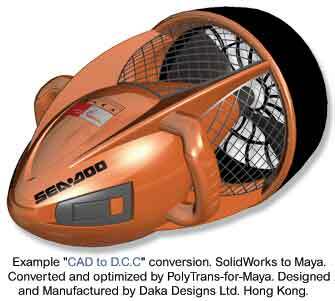 Popular for ProE, SolidWorks, STEP, etc. to DCC. Highly refined & popular MAX <-> Maya pipeline via native plug-ins, with over a decade of development. Robust import & rendering of CAD and AEC models. Acts as a "stepping stone" to allow for massive CAD assemblies to be downsized in PolyTrans first before import into downstream D.C.C applications. Publish to WEB streaming file formats such as Viewpoint VET, OpenHSF, SW3D, U3D, XGL & VRML1+2. Others in development at all times. 17+ year development. Personal and dedicated hands on support direct from the Okino developers. Solid, robust solution used around the world by most major companies and professionals. Easily develop new plug-in modules such as import/export, renderers, modelers, etc. Mesh & scene processing toolset. Very stong support for all major CAD file formats. 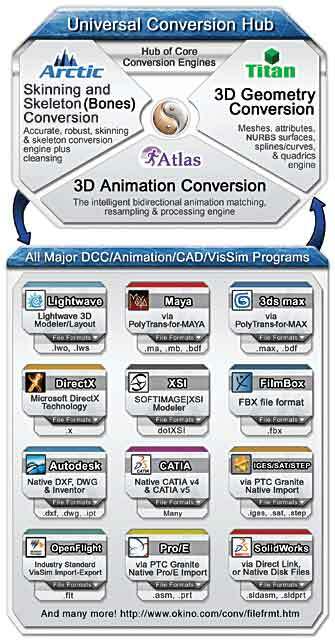 Bidirectional conversions between all D.C.C (animation and digital content creation) programs. Maya, XSI, Soft-3D, LW, DirectX, U3D, more. Photo-realistic rendering, material editing, texture parameter editing and scene composition (ray tracer in Okino's NuGraf only). Handles very large CAD datasets. �Document-centric� architecture, extensive user interface plug-in API, and 2D/3D import/export API. Excellent, built-in polygon reduction system. Integrated multi-media editor & viewer (see 2D bitmap file format list below). NVIDIA & ATI real-time shader support, with third generation OpenGL support. Plug-in modules and import/export converters from third party vendors, including AIR renderer from SiTex Graphics. Optimized since its inception to handle very large datasets, such as 500,000 node scenes and millions of polygons (most animation programs can only handle 50,000 nodes). NuGraf only: Caustics, an amazing lens flare system & sunlight calculator. The standard for plug-in SDK development. Third party developers can create 3D import/export converters, system plug-ins, renderers and many more. Stable and completely refined. 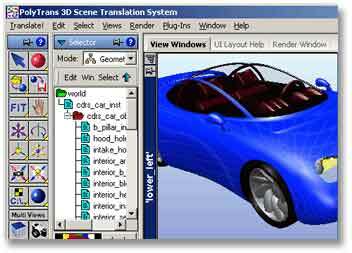 Used by dozens of leading 3D software companies. Complete list of features, file formats, brochures, user list and demos available on the Okino WEB site. 3D Import File Formats: Apple 3D Metafile, 3D Studio	MAX	(native plug-ins),	Adobe� Illustrator, Biovision BVH and Acclaim motion capture, DirectX, DXF/DWG, Electric Image FACT, FilmBox (FBX), IGES, GameExchange2, Inventor (Autodesk CAD), Lightwave, Maya (native plug-ins) , Okino native	BDF, OpenFlight, OpenNURBS, PLY, Protein Database	(PDB), native Pro/Engineer assemblies and part files, Rhino-3D/OpenNURBS , Sketch-Up, SOFTIMAGE-3D, SOFTIMAGE-XSI, Solid Edge , SolidWorks, STL,	Strata v1.75, trueSpace, U3D, USGS DEM & Gtopo-30, VRML1/Inventor2, VRML2, Wavefront (Full NURBS + Polygons) and XGL. Native CATIA v4. ACIS SAT, IGES-solids, native ProE, STEP, Parasolids, Pro/Desktop, and VDA. 3D Export File Formats: Apple 3D Metafile, 3D Studio MAX (native plug-ins), DirectX, DXF/DWG, Electric Image FACT, GameExchange2, HOOPS HSF, IGES 5.x, Lightscape, Lightwave, Maya, NGRAIN .3KO, Okino native BDF, Open GL C Code, OpenFlight, PLY, POV Ray 2.0 and 3.0, Pro/E SLP 'Render File', Renderman RIB (NURBS and Meshes), RenderWare/ActiveWorlds, Rhino-3D/OpenNURBS, Shockwave-3D, SOFTIMAGE 3D and XSI, STL, Strata v1.75, trueSpace, Wavefront OBJ, U3D, Viewpoint VET, VRML 1, VRML 2 , XGL and SGI Inventor2. 2D Bitmap File Formats: TIFF, JPEG, BMP, SGI, GIF,	IFF Lightwave, IFF Maya, PIC (Softimage),	PIX (Maya),	PNG, PPM,	PSD (photoshop) and Targa. Additional LeadTools supported bitmap file formats: AFP, BMP, CMP, CUT, EPS, EXIF, FLC, GEM, ICO, IFF, ITG, FPX, MAC, MSP, PCD, PCT, CLP, PCX, PSD, PBM, PNG, PTK, SCT, SGI, SMP, RAS, TIFF, TGA, WBMP, XWD and XPM. Video formats supported for viewing: AVI, MPEG-1, 2, 4, QuickTime Movies (.qt, .mov, .mtv) and	Macromedia Flash (SWF). These two special, native plug-in versions of PolyTrans run inside 3DS MAX and Maya. See elsewhere on this CADalog.com WEB site. 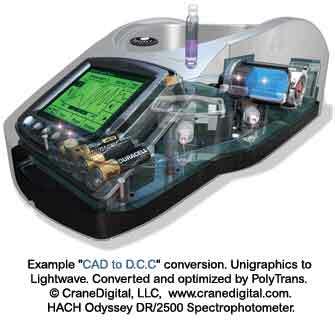 For over a decade they have provided the industry standard for add-on 3D CAD, DCC and VisSim converters inside of MAX and Maya. This is one of the most popular aspects of PolyTrans in the D.C.C. community. PolyTrans-for-Maya is available via the "DCC/Pack" license. CAD/Pack - Includes Autodesk Inventor importer, DWG importer (with ACIS solids support), IGES 5.3 import and export (allows for native import/export of NURBS surfaces and curves), Solid Edge import and SolidWorks import. DCC/Pack - Includes Kaydara FBX importer, OpenFlight import/export, PolyTrans-for-Maya native plug-in system, PolyTrans-for-Softimage XSI native plug-in system, Softimage-3D .hrc and .dsc import/export, Softimage XSI (.dotXSI) import/export. Granite/Pack - Includes PTC Granite solids-based CAD importer licenses:	ACIS, IGES (solids), Parasolids, ProE native parts & assemblies, Pro/DESKTOP, STEP & VDA-FS. Also includes Okino surface-based IGES importer as a complement to the solids-based PTC IGES importer. CATIA v4 - Import from native CATIA v4 .model files. CATIA v5 - Import from native CATIA v5 .catProduct and .catPart files. JT Open - Import from native JT files. Utilizes the official JT Open importer libararies from UGS.
" We purchased PolyTrans and used it for 3D data conversion and optimization of datasets created for the NASA MER space program (Mars Exploration Rover Mission). It is fantastic software. My colleagues at another NASA center spent days using three software packages on what took me 15 minutes using PolyTrans alone (polygon reduction in batch mode worked	like a charm). I just wanted to thank you for creating	such a great tool." Boris Rabin, Visualization Development Lead, NASA/Ames	Research Center, FutreFlight Central.
" I very rarely praise a piece of software but PolyTrans is nothing short of excellent and is the most used piece of software in our department. It is generally accepted within the modelling and graphics team that PolyTrans greatly improves our work flow and efficiency particularly with the seemless plugin to Maya and the accurate conversion from one format to another in either graphics or geometry. We would be lost without it." Lazaros Kastanis, immersive visualisation specialist, University of Queensland's Advanced Computational Modelling Centre.